Colors always help us to open our hearts to life and feel good about whatever is happening around us. These last few days, Algeria has been going through some sort of an evolution, or a revolution, and people decided to call it: The Stairs revolution. 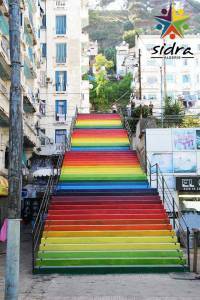 A few days ago, some people from Algeria, especially youth, started to share pictures of a new form, pictures of stairs becoming colorful. Usually, all people can see when they take stairs are stairs full of dust and dirt. And it is the same case in every Algerian city or region. The state of public stairs in Algeria is in a bad situation, resulting from the negligence of local authorities and the incivility; stairs are cleaned once a week or less. What is sad is it became something normal. Something that is meant to exist in the Algerian work in general, and in Algeria’s streets. People may not notice how much this dust and dirt can affect their daily mood. People got used to seeing things like this every day. People got used to living in the middle of this every day. But all that it took was one move, one different move from one different person that made us all discover how much a small action can change everything around us and create a revolution. That’s how the Revolution of Stairs was created. 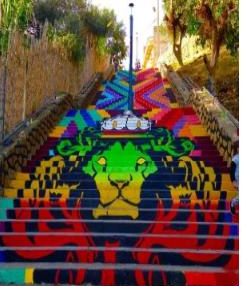 A small group of youth from the national association SIDRA decided to change the state of the stairs in their city, and their action inspired many people across all of Algeria to join their cause and start to implement the idea on all regions and cities. The idea was simple: that everyone could do it alone, or with a group of friends enjoying doing volunteer work. The first step is to choose a stair in your home city, then to buy colorful paint, and finally to volunteer by spending half of your day making those dusty stairs go full of color, full of life. It is indeed a small gesture from Algerian youth. But the impact of this action is bigger and bigger day after day. Today, many people are seeing those stairs and many kids are telling their parents of how beautiful those stairs are. Many people got inspired by this small gesture and tried to do the same in their region. The action of these young people became an example for other youth, and also a sign of the will of the Algerian youth to bring a positive impact to their society. Now, youth in Algeria are aware of their environment, and try to bring new positive things to the place where they live that could affect people in a good way, inspire them, and build a better tomorrow. Because after all, if it is not us who builds our country, who will? Posted on February 15, 2015 July 27, 2015 by alisonarnold7Posted in English, UncategorizedTagged algeria, change, stairs revolution, yala young leaders.